Revenues have doubled since Jackie arrived at Dare to Care in 2010. Businesses such as the local Brighton Collectibles also sponsor food drives. Jackie visits cook Floyd Bowden at the Community Kitchen, which was built last year with the largest private donation DTC has ever received. The Community Kitchen caters to 27 Kids Cafes, safe places where children can also get help with homework and extracurricular activities. 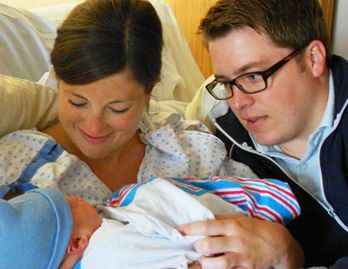 Jackie and her husband, Dan, joyously welcomed their son, Henry, in 2012. They are expecting their second child in March. 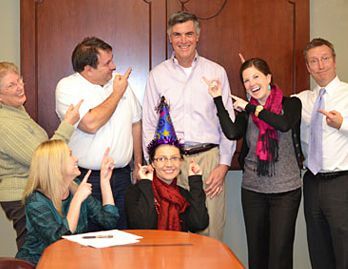 Executive Director Brian Riendeau (center) values a fun, energetic culture. He looked for the right chief development officer for a year before he met Jackie. Jackie Keating remembers taking her husband, Dan, to Thanksgiving dinner for the first time. They had been dating for about six months in 2002, and it was time to see if he would fit into the family. Her relatives always gather at a country club for the holiday. As they enter the big, bustling dining room, Dan turns to Jackie and says, "So where is your family sitting?" She sweeps her arm across the entire room. "This is my family." Dan, who comes from a family of four, has never seen so many relatives. Jackie's mother is one of seven children, and Jackie is the oldest of 21 grandchildren. She remembers growing up with weekly dinners at her grandmother's house and has come to love cooking, eating and feeding others. Family plus food equals love. It's not surprising, then, that Jackie serves as chief development officer at Dare to Care, the community food bank in Louisville, KY. It is remarkable that she was appointed to the position at age 28 and has more than doubled revenues in the four years since. "If she makes up her mind to do something, she'll do it 150%," says Laura Barkhauer, her mother-in-law. "It's in her DNA. It's not an option not to be successful. It comes from her family." Jackie agrees that her work ethic and values stem from her mother. Julie Rorrer is only 18 when she has Jackie. She both goes to college and works full time. Despite a $20 weekly budget for food, she manages to feed her family of three. Jackie never feels deprived, largely because her enormous family, including her grandmother and great grandmother, take care of one another. Determined to succeed, Julie becomes a self-made woman with her own CPA firm. She and her husband also have two sons. "When I think about strength, my mom is the strength of our family," says Jackie. Dan passes the Thanksgiving test. After college at Indiana University Bloomington, he and Jackie move to Chicago in 2005 to pursue jobs in sales. An art history major, Jackie doesn't feel quite suited for that kind of work. Fortunately, her boss is on the board of the local children's hospital and asks her to help him organize a fundraiser. Not only does she do a spectacular job, but she realizes that she has a tremendous passion for fundraising to help others. When Children's Oncology Services starts hiring paid staff in 2006, she joins the nonprofit. It gives her a complete overview of how to run such an organization. As the second employee, she does everything from strategic planning to courting the biggest donors to taking out the trash. After they get married in 2009, Jackie and Dan start thinking about moving home. They have been making the five-hour drive from Chicago to southern Indiana every couple of weekends. They know they want to be closer to their families when they start to have kids of their own. Around the same time, Brian Riendeau arrives at Dare to Care as its new executive director. He sees immediately that the nonprofit lacks a development director. It's his top priority to hire a seasoned, accomplished professional for that role, since, as he puts it, "without money, we can't feed people." Dare to Care was named the Nonprofit Organization of the Year by Business First for 2013. He specifies in the job description that he is looking for someone with 10 years' experience at well-established nonprofits, yet he is underwhelmed with the "qualified" candidates he sees. He posts the job again -- even hires a local executive search firm to recruit -- and is again disappointed by his options. About a year into this process, a board member sends over a resume. It is for the niece of a friend of his. "She's very young and lives in Chicago," he says to Brian. Feeling obligated to follow through and not having a lot of options, Brian reviews Jackie's resume. Sure enough, he thinks to himself, "She's very young and lives in Chicago." Nevertheless, he emails her and offers to meet the next time she comes home for a visit. When she walks into his office a couple of weeks later, she looks even younger than he expects. "She's too young to babysit my children," Brian remembers thinking. "I would have to call the neighbors to let them know there was a youngster looking after my kids." Yet as they start to interact, Brian realizes "there's something about her." He has interviewed more than 20 other people in the past year, and no one seems to have her combination of poise, energy, authenticity, sociability, competitiveness and positive attitude about people and life. She also seems to live by the values of the organization, one of his most important considerations as he builds a conscious corporate culture. Other people in the office meet with her, and they come away with the same impression. After a third interview and conversations on the phone, he decides to take a chance on Jackie. Revenues have grown from $3 million to $6.5 million since Jackie arrived. Dare to Care also ranks in the top five of food banks on Charity Navigator with an overall rating of 99.66. She now leads a four-person team and has become a true champion in the community. As Dan says to Laura when they first relocate, "Jackie is not going to be happy till she has met everyone in Louisville." Indeed, it seems the people and businesses in the "Kentuckiana" area share a personal, emotional connection to Dare to Care. The food bank was formed in 1969 when a local nine-year-old boy died of starvation on Thanksgiving eve. That shocking news galvanized the community to pledge that such a tragedy would never happen again. A local priest started Dare to Care in his church basement, and it has grown to be an inherent resource in people's lives. To remember its roots, it still organizes a Thanksgiving eve vigil every year, a silent candlelit walk to the street corner where the boy lived. Shops such as the local Brighton Collectibles sponsor food drives to support the food bank or make sizable donations. The organization received its largest private contribution last year, a $1.5 million gift from the Lift a Life Foundation that largely funded the building of a new Community Kitchen. The facility prepares fresh healthy meals for 27 Kids Cafes -- safe places where kids can also get help with homework and extracurricular activities. Another program, Backpack Buddy, provides food for weekends, when kids can't get free school lunches. 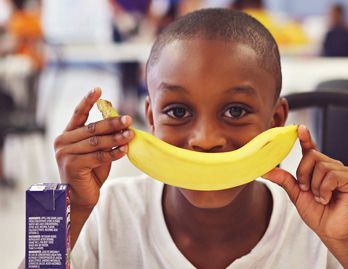 Since its mission expanded from providing food to conquering the cycle of need, Dare to Care hopes programs like these, which are focused on developing children, help eliminate their visits to the food bank later in life. 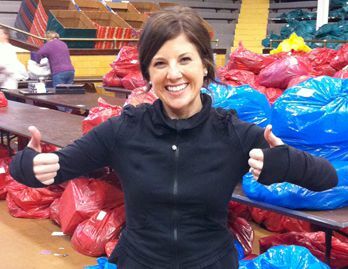 Without the standard fundraising experience, Jackie succeeds at Dare to Care by doing things her own way. She remembers her mom's journey and empathizes with families facing similar challenges every day. Her fierce commitment seems to come naturally. "It's easy to talk to people about something I believe in to my core," she says. As for her Thanksgiving, the gathering gets bigger and bigger. Dan and his family now join Jackie and her relatives at the club. Jackie and Dan also have a two-year-old son and is expecting their second child in March. Ralph, their adorable Goldendoodle, also clamors for his share of attention. 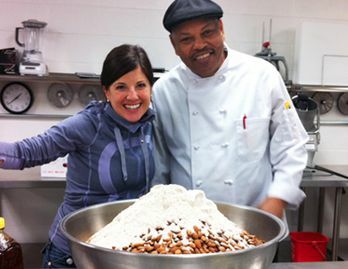 Between raising her own family and feeding her community, Jackie has her plate full of love. Scientist Linda DiBella became a health coach to serve up advice on food and nutrition.